When I was at school, we had a careers advisor who would repeatedly ask students “Are you sure you want to go to university?” And most of us would respond in the affirmative without much in the way of a second thought. But when that first Christmas after leaving school came around and I met up with old classmates, many of the mumblings of dropping out, being sick of the town they now called home or changing courses made it apparent that some students should’ve, perhaps, considered their answer a little more carefully. Post-recession, rising tuition fees and changing employment trends have made the decision over whether to go on to higher education or not an increasingly weighty one. Previously, many 18-year-olds would simply earn their A Levels and then see going on to university as the natural progression of their studies. 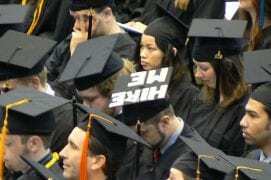 They would have given little thought to the debt they might incur or what they would do with their degree once their three or four years of studies were up, safe in the thought that having a degree would secure them a job and a higher salary. During the particularly challenging mid-recession years, some students even reported starting a degree simply to rule themselves out of the job race for a few years. The hope was that they would finish their course at a time when the job market had improved and they would have a degree to boot. This applies to mature students as well, the majority of whom are women, according to the National Union of Students. If you harbour ambitions of running your own business, some will argue that it’s a waste of time going to university at all. Many in this position will no doubt have heard the old-fashioned ‘University of Life’ argument, and it’s easy to see why some shun academia in favour of on-the-job experience. I would argue that higher education and business ownership skills can and should be interchangeable, and that any qualifications you pick up are a sign that you can see a task through and have the intelligence that lends itself well to entrepreneurship. Indeed, universities are developing courses that transfer more directly to routes of employment, helping students to not simply pass exams but also pick up job-transferrable skills. It is common to hear students complain that they “don’t have time” to do tasks such as look for work, develop business ideas, eat properly and do their washing. While some courses, particularly in subjects like nursing, can require 30+ hours a week of study, others may only require students to attend as few as four or five hours of lectures and seminars during the week. Once the reality of the 9-to-5 job has set in, and possibly raising a family, graduated students often realise that they never had so much free time in their lives as they did during their student years. So, don’t spend all your spare time in the pub (although relaxation is, of course, important). Instead, use it to research and pick up additional job and business skills. Most universities encourage their students to find a part-time job, although they tend to suggest limiting it to 16-20 hours per week. For most, this will mean putting in some hours at a local shop or bar but there’s no reason why it can’t be time spent on your own business plan and ideas. Allocating time to carry out market research, approach possible investors and draw up business plans is using your spare time productively – even if it’s just a little bit each week. Keep an eye out for potential niches and opportunities. Another option is to choose a course with flexible hours, allowing you to prioritise your business and work commitments and complete your studies when it suits you. There are literally thousands of distance and online courses available, most of which can be completed over a range of time periods. I chose to study an Open University course while working full-time and the flexibility it offered was a real advantage. Since OU degrees are awarded through the acquisition of set numbers of points, you can transfer your points over to another course if you wish, or even take a year out to concentrate on something else. And if you decide to opt-out partway through and you’ve earned enough points, these can be transferred to a Higher National Certificate or Diploma. These options make it an excellent choice for anyone looking to earn a degree while frying other fish. From my experience, distance learning courses require more self-discipline. However, because you have to manage your own time and motivate yourself to get tasks done, you are developing useful skills to take to running a business. Students rarely understand the merits of collaboration and networking, other than perhaps on social media. At university they are surrounded by people with interests and knowledge across a broad spectrum of disciplines, so they shouldn’t be frightened of seeing what they can learn from those in other subjects. Those in their final year of studies usually need to carry out a research project that might involve interviewing people and compiling statistics. If you’re interested in a certain sector, why not approach somebody in a relevant subject and exchange ideas? Personally, I’m a big advocate of networking and learning from peers, which is why I have employed a number of business mentors at various challenging stages of growing my business. I’m also part of a group that teaches how to network and use word-of-mouth marketing to grow a business. Anybody who has been to university will have learned a lot about money and how to use it. Particularly for those who go straight from living with their parents to studying in another part of the country, the difference in money management when you have to pay your own rent and utility bills and for your food is enormous. If nothing else, students learn how to manage a budget and this can only be a good experience for those that plan to go into business ownership afterwards. You can even use your personal finances as a bookkeeping exercise, recording your income and outgoings and drawing attention to areas where you might be able to show more prudence. It’s wise to take a basic bookkeeping course before diving into tools like Sage and QuickBooks, however, as it really helps to have a basic understanding of accountancy principles – always handy when you employ a bookkeeper or accountant. Figures published by the Higher Education Statistics Agency in January of this year show that female university students are just about outperforming males, with 70% achieving first or upper second class degrees as opposed to 65% of male students. Perhaps even more encouraging, from a business point of view, a recent study by Amazon revealed that 52% of startups are now being launched by women. I have seen this reflected in the rapidly increasing numbers of women present at networking events and take-up membership of our networking group. Long-standing organisations like the Institute of Directors are also now proactively looking to encourage female membership. Education and business acumen should not be seen as obstacles to one another and, with women excelling in both, it bodes well for a generation starting to see the benefits of having more women in senior business roles.